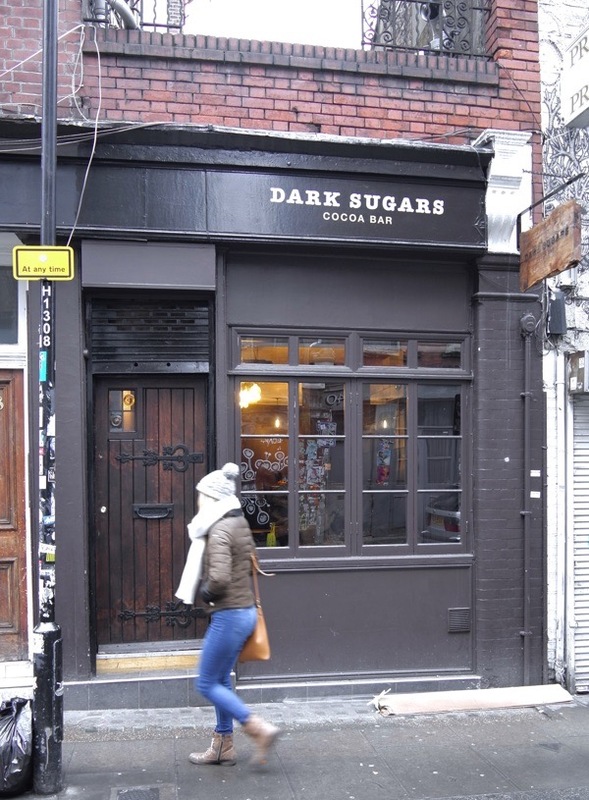 This is 45 Hanbury St in 1919, an address which hardly exists anymore – today these premises serve as the back end of a chocolate shop, one of more than six such establishments in Spitalfields. Yet a century ago it was home to the family business of JH Fisher, making and repairing umbrellas and parasols. In this photograph, taken on 19th November 1919, we see Juda Hersz Fiszer and his wife Malka standing outside their shop. They came to London from Warsaw at the beginning of the twentieth century and, although the family anglicised their name to ‘Fisher,’ Juda and his wife kept their Polish nationality. 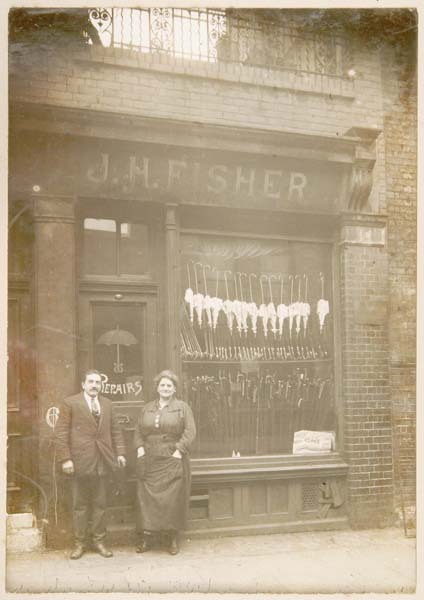 Juda Fiszer was a skilled umbrella-maker and established his umbrella business in Spitalfields in 1907. During the First World War, the family moved to the more desirable area of Hackney and set up home at 123 Victoria Park Rd. Their son Morris Fisher continued the family business but, by the thirties, the Hanbury St shop was taken over by a tailor and Morris had a stall in the Whitechapel Rd, selling rather than manufacturing umbrellas. Spitalfields has good reason to be seen as the place of origin of the umbrella-making industry in this country on account of the local availability of silk and whalebones from the London Docks at the end of the eighteenth century when these popular accessories first became readily available. James Ince & Sons is the longest established company of umbrella manufacturers in Britain and Richard Ince, the current incumbent, can trace origin of his business back to White’s Row in 1815, though he believes it was in existence before that. 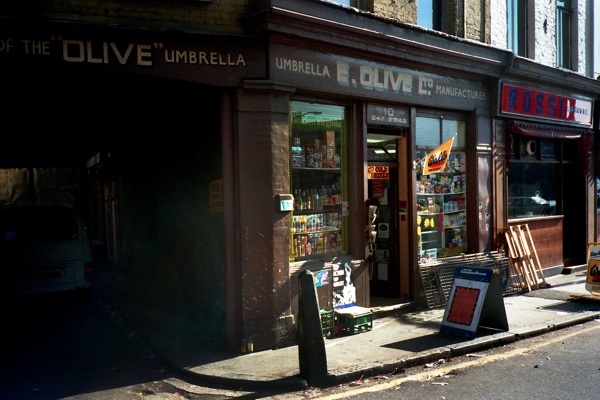 Today Inces’ Umbrellas trade from Vyner St but they were in Spitalfields for over two hundred and fifty years before moving to Hackney in the eighties. The last remnant of this former industry in Spitalfields was E Olive Ltd, an umbrella shop and manufacturer at 10 Hanbury St which closed in the late eighties yet, such is the cyclical nature of history, the recent revival in quality British-made umbrellas has the occasioned the arrival of newcomer London Undercover which has traded successfully from 20 Hanbury St since 2013 – selling umbrellas less than fifty yards from JH Fisher a century ago. It looks like part of the wrought iron railing along the balcony, above the shop, has survived the years between the two photographs. I have only just subscribed to your amazing enterprise so was especially pleased today to read about the umbrella makers of Spitalfields. I’m researching the life of my grandfather, Alf Levy (1890-1969), who, like his two brothers, was described as a stick-maker on the 1911 census. Do you think that stick-makers would also have made umbrellas, or were the two trades separate? Where can I learn more about stick-making? I feel very happy for Derek, above, since he is about to make wonderful/daily discoveries. can almost envision what the interior of the umbrella shop looked like. With the Gentle Author as historic chronicler, the City of London is in great hands. Nana and Zaida lived at 23 Hambury Street. Opposite the Christian Mission to the Jews. At the entry to 23 there was a long passage. the right the family rooms. a stone wash tub and a mangle. woke me up with the hoods on the cobbles. have. It said M Rich. 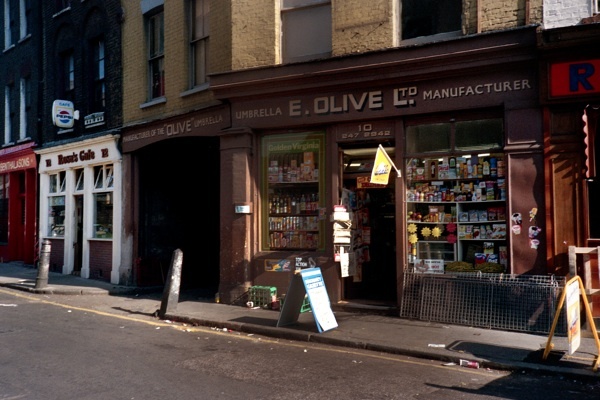 My late mother worked for mr olive making unberells I often went with her to work at 10 hanbury street oh such memories.